The loss of a limb can be one of the most devastating outcomes of a serious accident. At Kraft Davies, PLLC, we represent clients who have suffered amputation in or as a result of workplace accidents, maritime accidents, dock or pier accidents, industrial or construction accidents, commercial trucking accidents and others. Our Washington personal injury lawyers work closely with medical experts and occupational specialists to determine the full impact of your injury. We then take an aggressive approach to recovering maximum compensation from liable parties. If you have suffered a loss of limb due to another's negligence, take action to hold the responsible parties accountable. For experienced representation, contact us at 206.624.8844. After an arm or leg amputation, patients can suffer problems with mobility and caring for themselves because of the loss of a limb. 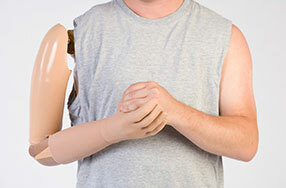 Many people with amputation injuries experience phantom limb symptoms, where they feel pain, numbness, itching, aching or other symptoms in the absent limb. Sometimes patients have unexplained symptoms in an unrelated body part such as unexplained pressure or movement on the face or head. Patients with amputations can also encounter skin problems and ulcers in their stumps that may require further surgery or other treatment to address skin issues. In most cases, use of a prosthesis (artificial limb) can improve patients' mobility and overall function. A prosthesis, however, requires ongoing maintenance and will need to be replaced frequently. In addition to the added expense of maintenance and replacement, prosthetics require ongoing evaluations by a physical medicine and rehabilitation physician. When a leg amputation is involved, a patient may have problems with walking or driving that may require other adaptive devices like wheelchairs and modifications to their vehicles that can be expensive over time. Our personal injury attorneys focus our representation on attaining maximum compensation to cover both the short- and long-term care costs for those who have suffered an arm or leg amputation. We are selective about the cases we take, only handling those we believe can be recovered successfully. In this way we can devote all our resources and personalized attention to those who most need our services. If you or a loved one has suffered a loss of limb in a maritime accident, construction accident, commercial trucking accident or a workplace accident, please contact us for a free case evaluation with one of our skilled attorneys.